The annual MNDF marksmanship competition for Major Ingereysi Umar Manik Memorial Competitive Trophy has begun in Girifushi. Major Ingireysi Umar Manik spent his life in service to the Maldivian military and was in charge of guarding the MNDF weapons arsenal. 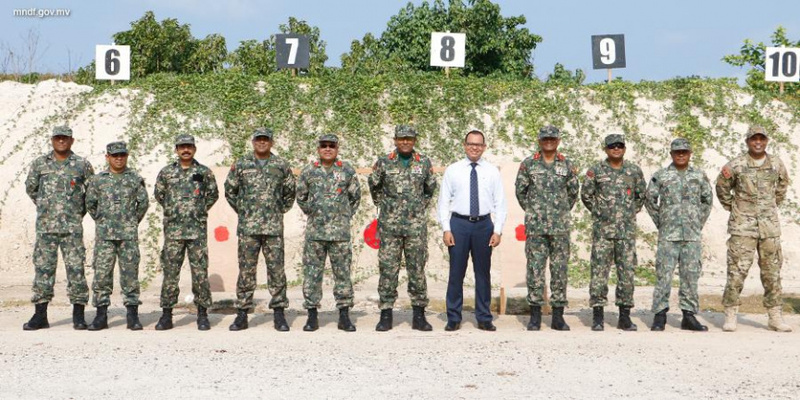 The annual marksmanship competition was inaugurated this Saturday morning by Minister of Defense, Adam Shareef Umar. The shots to kick-off the competition were fired off by Chief of Defense Force, Major General Ahmed Shiyam and Vice Chief of Defense Force, Brigadier General Ahmed Shahid, as well as general officers. The competition will continue until April 5. 21 units of the MNDF have joined the competition. Speaking at the inauguration, Chief of Defense Force, Major General Ahmed Shiyam spoke of the service to the country by military officers, and the need for better training.